Introducing The Largest 3D Street Painting. Ever. 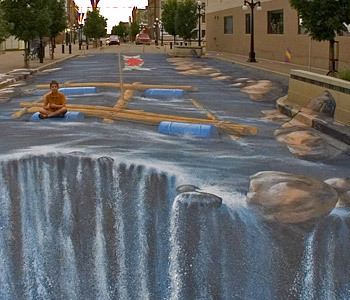 Sitting on top of his chalked raft, Edgar Muller is headed for a waterfall at the end of his massive 3D street painting. You’ve seen them before: artists who camp out on urban street corners to chalk some of the most impressive sidewalk attractions are pretty famous on the web. But this guy has helped draw what some people are claming could be the largest painting of its kind. Drawn on an entire street, he turned a road in Canada into a work of art. River Street is now a river. And it took a whole team of artists at the Moose Jaw Prairie Arts Festival to do it. Check out the whole gallery here to see more images of the process.